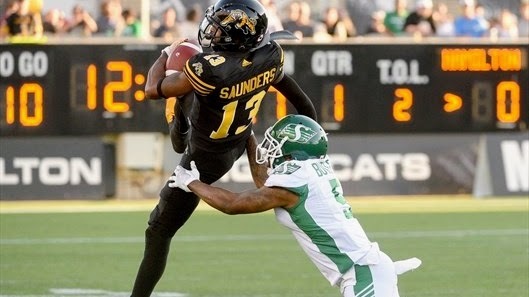 “Saunders was selected in the fourth round of the 2014 NFL Draft by the New York Jets, despite an arrest for marijuana possession in college. He suffered a seizure while driving to a training camp practice, a health scare that was later attributed to an allergic reaction. Released by the Jets after just three games, he bounced around to five other teams before a 10-game suspension for recreational drugs — his fourth violation — saw him wash out of the league for good. He doesn’t make excuses for any of this. Out of the game for almost 18 months, he admits to spending an inordinate, even unhealthy amount of time thinking about what he’d lost. The urge to move on from the game was there, to try and put the shame of failure behind him. A stint in The Spring League — the same showcase enterprise that Johnny Manziel played in — led to an opportunity with the Ticats, who had added him to their negotiation list. Released after training camp in 2017, he joined the practice roster and started for the first time in week three after an injury to receiver Terrence Toliver. TSL LB Mike Scherer invited to Seattle Seahawks mini-camp!